Cytocal™ is a multi-amino acid calcium chelate based on Biotron's proprietary mineral processing technology. Refined over 3decades, our approach relies on understanding the metabolic pathways by which the body absorbs, maintains and metabolizes minerals then harnessing this knowledge to best prepare these compounds. Where nutritionally essential minerals are concerned, calcium is truly in a class by itself. The daily requirements for calcium are over 1000 milligrams per day for most adults. It is hard to overemphasize the roles calcium plays in the body. Calcium is involved in a wide array of biological processes - from intracellular signaling to neurotransmission and muscle contraction. Despite these various functions, it is calcium's definitive role in supporting bone health that makes this nutrient so vital. It's one of the few essential nutrients for which an FDA approved claim can be made. It is difficult to overemphasize the importance of achieving peak bone mass in adolescence and early adulthood to minimize risks of osteoporosis later in life. Unfortunately, most women fail to get enough calcium from diet alone. For many, supplementation is indispensable to achieving adequate daily intake.Not all forms of calcium are created equally and controversy over which type is best continues to be a matter of debate. Its thought that organically-bound calcium is preferentially absorbed when compared to widely used inorganic forms such as calcium carbonate.Demonstrating this experimentally is challenging. Because if its importance, calcium levels in blood are very tightly regulated by the body. Parathyroid hormone (PTH) - among other hormonal control systems - function to maintain this delicate balance. 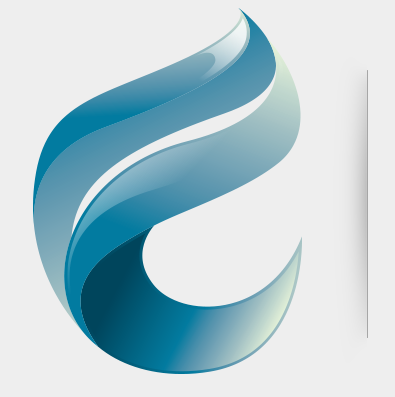 To demonstrate superior bioavailabilty of Cytocal™ relative to inorganic calcium (as calcium carbonate), a single center, randomized, double blind, acute crossover pilot study was performed to test the pharmacokinetics of absorption and effects on parathyroid hormone levels in healthy women. The acute study consisted of two 12 hour monitored treatment periods with a minimum one-week washout period. A low calcium diet was followed for seven days prior to each test. Four calcium tablets (500 mg total Ca) were consumed in clinic after which blood was drawn at 30 minutes, as well as 2,4,6,9 and 12 hours post-dose. A pre-dose sample was collected to determine baseline values. Fifteen volunteers were enrolled of which 14 completed the study. The pharmacokinetics and relative bioavailability were measured (Cmax, AUC (0-12h) and Tmax). Levels of parathyroid hormone, which decrease in response to increasing serum calcium concentration, were also evaluated. The safety of the two test materials were carefully monitored throughout the course of the investigation. 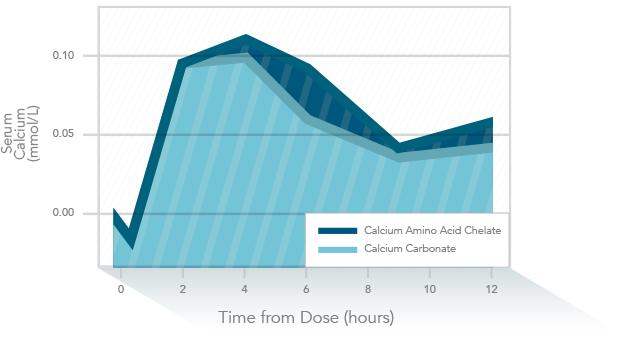 Mean serum calcium concentration (mmol/L) changes from baseline over the test period for the two test products are illustrated. More calcium was measured in the serum when each volunteer was given Cytocal™ than calcium carbonate USP. 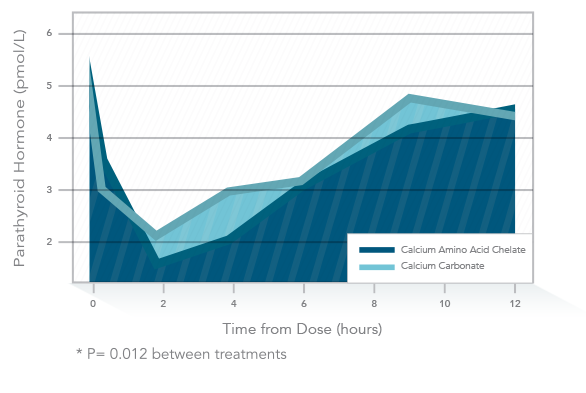 After four hours, serum calcium from Cytocal™ is 16.6% higher than for the carbonate Demonstrating this experimentally is challenging. Because if its importance, calcium levels in blood are very tightly regulated by the body. Parathyroid hormone (PTH) - among other hormonal control systems - function to maintain this delicate balance. The Pharmacokinetics are shown in figure 2. 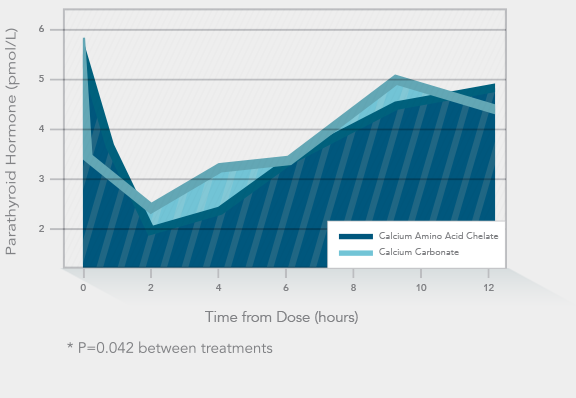 The maximum blood concentration of calcium (CMax) was higher for Cytocal™, the time for this effect (Tmax) was shorter for Cytocal™ and total calcium measured AUC(0-12h) over the 12 hours was greater for Cytocal™ than for carbonate. While these measurements where not statistically significant, the trends from this small sample size suggest Cytocal™ performs better in all three areas. The mean serum parathyroid hormone (PTH) concentration (pmol/L) over the 12 hour period following oral administration of the test products are shown in figure 3. PTH falls in response to calcium activation of receptors in the thyroid gland, kidneys, bone and other tissues. Low PTH indicates increased calcium activation of these receptors. The difference between the effects of calcium carbonate and Cytocal™ are statistically significant, demonstrating the improved systemic distribution of calcium from Cytocal™ in this acute setting. The change in baseline values are shown in figure 4. Cytocal™ causes a larger drop in PTH which lasts longer than the effect of taking an equivalent amount of calcium carbonate. This observation is also significant, indicating more plasma calcium was activating PTH sensitive receptors and the effect lasts longer than for calcium carbonate. The data collected from this clinical study show that CytocalTM has a meaningful impact on the body's response to oral dose calcium when compared to calcium carbonate USP. The effects happen faster – producing greater effects which persist longer – than they do when taking calcium tablets prepared with the inorganic salt. Such data inform product development specialists when considering a new stand–alone calcium product, an extension to a firm's product range or a new and improved version of an existing product. Smaller quantities – taken less frequently – may be considered to achieve similar effects. Legal Disclaimer: The statements contained herein have not been evaluated by the Food and Drug Administration. This product is not intended to diagnose, treat, cure or prevent any disease.